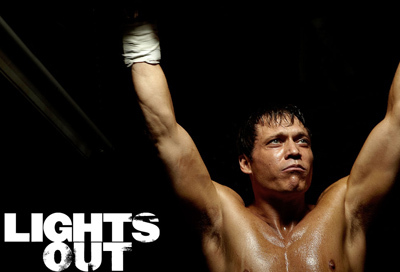 Lights Out is FX Networks’ newest drama, and it’s a really nice slice of life about the world of boxing and the fallout from it. 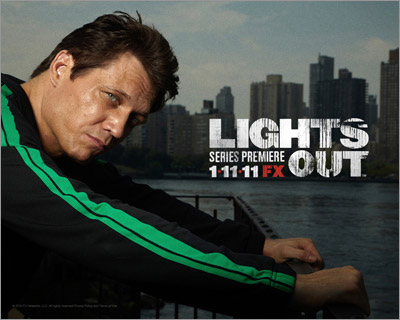 Veteran character and supporting actor Holt (Fight Club, The Losers) McCallany stars as Patrick ‘Lights’ Leary, the former heavyweight champion of the world. He’s joined by the excellent Stacy Keach, Catherine McCormack, and Pablo Schreiber and I was lucky enough to have a chance to speak with McCallany and series executive producer Warren Leight on a conference call about the new show. 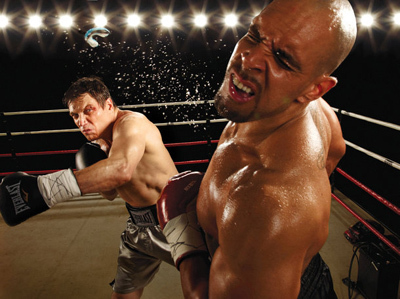 Nick Nunziata: Even though boxing is extremely cinematic and something that a lot of us can connect with and be inspired by, the sport is obviously not in the same place it was 10 or 15 years ago. I want to get your take, whoever would like to speak on this, how that affected your approach to representing the business of boxing and also how you feel the sport is going to persevere and rise up in the face of some of these MMA type sports. Warren Leight: I’ll jump in first. One of the things that I liked is that boxing isn’t where it was 15 years ago or 20 years ago, although by the way, boxing has never been where it was. Whatever you read boxing works they always talk about the golden age, which was 20 years earlier, no matter when you’re reading something. But I liked that boxing is on hard times because I feel this is a show, Lights really, there’s a metaphor going on here. A lot of people have gotten clobbered in the last three years, not just boxers, a lot of people are trying to figure out how to take care of their family or provide for their own and taking bigger risks than they should. If we’d gone in and gone with the NBA, that’s a whole other world. Boxing is a sport that’s also going through hard times, that’s being usurped by other sports. In the fourth episode, I don’t know if you got that far or have seen it, but we have Pops and Lights, Stacy and Holt, sitting in a bar hoping to watch a big welterweight match and all that’s on on all the screens is MMA, and they look like two guys from another generation. That was conscious on our part, that this is a world that is not getting the respect or attention that we think it deserves. Therefore, also it reinforces the sense of an athlete in possibly decline, America in decline, or a sport in decline, because boxing is up against it. We have a sports journalist who says to Lights early in the season, “You think boxing’s in bad shape, try writing about boxing for a newspaper.” We’re not going into a world where the money is flowing, even if you’re doing well. We met a lot of these boxers and we know how hard they’re working to take home what little they’re taking home, and I think it reinforced the theme for the story that we were in this world of boxing and that boxing is where it is now. I’ve also written about jazz and I’ve been a theater writer, and those are two other worlds that aren’t where they were 15 years ago. What happens in those worlds is that the community draws closer together and tries to take care of its own as best as it can, and people respond to the pressure or have to get out. I don’t think it was an original, conscious choice, but I thought it reinforced a lot of the themes of the season that we were in this world. Boxers are a different breed, they don’t really whine. … people watching the NBA this year, they’re giving technicals for whining. That’s just nothing that would happen in boxing. When you go to a boxing gym, if it looks clean and flashy it’s the wrong place. So that just helped give us the edge that we were looking for in the show. Boxing’s decline in a way helps us tell the story. 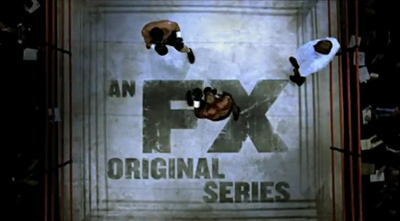 Yes, it’s an uphill battle for boxers and maybe it’s an uphill battle for a show about boxing, but the show is about an uphill battle so it’s okay. Holt McCallany: The only thing I would add to what Warren just said was—and I don’t want to be overly optimistic, but it would be wonderful if the show were to become a success if in a small way we could help to refocus people’s attention on the sport. Help to remind them what a great sport it is and what they always loved about it. Nick Nunziata: In the spirit of the underdog I’ve always looked to your work in films, Holt, is this guy one of those great character actors or is he going to get his chance to be leading man, at least something that gets a high profile? I wasn’t sure, because you are very good with limited screen time. You do a very good job of sticking out, but it was awesome to see you get this opportunity and just jump with it. What was it like knowing that you’re in almost every scene, you’re front and center? This is a different world for you. Holt McCallany: You know what, it sure is. As awesome as it may be for everyone else; it’s more awesome for me, I can promise you that. Having had both experiences, having had the limited screen time and having lots of additional screen time, I can tell you that I prefer the latter. Don’t get me wrong, I’m grateful for all of those opportunities that I had as I was coming up in the business. Learning my craft and working with great directors like David Fincher and David O. Russell and Lawrence Kasdan and Brian De Palma and a lot of guys that I’ve worked with that are really talented who recognized something in me, but people need to get a marquee name to sell their movies. So often you find yourself in supporting roles behind Brad Pitt or George Clooney or Robert De Niro, whoever it may be, and I’m really, really glad that I had those experiences because I learned so much and I feel like it made me ready when I finally had the opportunity to have more responsibility. Maybe if this opportunity had come earlier in my career, I don’t know, it might have worked out differently. I was really ready for this. What can I tell you, man? I hope that I’m going to get to play this part for a long time. I hope that it will ultimately, down the road, lead to other great parts. I’m never going to turn my nose up at working with those directors that I just mentioned or other people that I’ve worked with like that, but maybe in the future after this they’ll be more comfortable offering me bigger parts and saying, hey, look, Holt has graduated. I only had a brief window so I only got to participate minimally. Luckily, someone else asked about the participation and presence of Mr. Stacy Keach. Holt McCallany: They could have searched for 12 centuries and never found a better choice to play my father than Stacy. I have such tremendous admiration for him. First of all, he’s a consummate actor who has really done everything that you can do as an actor, from memorable film roles to an extensive stage career on Broadway and in the West End of London, and he played King Lear, and he carried his own series and he’s just done everything. Warren Leight: And he’s done some cheesy work when he had to too. He’s had a real actor’s life. Holt McCallany: Right. Yes, yes, yes. I mean it when I say that he’s the real McCoy. He’s had his ups and his downs, but it goes a lot further than us looking similarly physically, I think we think similarly and we see the world similarly. So there’s a tremendous bond between us and an unspoken communication that was there right from the beginning. I really like this guy personally tremendously and I respect him, and I learn from him every time we work together. Warren Leight: He was the show’s patriarch in a lot of ways. Every actor looks forward to a scene with Stacy and a lot of people had, in some ways each of them had a special scene with Stacy that’s one of their best moments of the year. He’s one of those guys. I remember the last day we were shooting, we were shooting at Hellgate Studios, which is an aptly named studio at the base of the Triboro Bridge in Queens, and Stacy’s call time was 3:00 a.m. Saturday because we had lost control of the week, it was the finale and the schedule had slipped. That’s never a good sign when you’re calling someone to work at 3:00 a.m., and it was 95 degrees, we had no air conditioning in that gym and there’s flies all over the place. It’s basically saying come to Purgatory for the night. And his back was out because the preceding three days we had been doing fight scenes and there was a lot of motion and movement, and he was supposed to do a scene where he was shadow boxing in the ring with Holt, father and son doing a little shadow boxing moment, and he could barely move. I just said, “Look, Stacy, we’ll do something else.” He said, “Well, let me give it a try.” Now it’s hard, he had to be assisted and it was just a bad, tough night. He gets into the ring, and Norberto Barba, the director, yells, “Action,” and he stands himself up with great effort and then starts shadow boxing like he’s 29 and Norberto yells, “Cut.” So in that moment he was no longer in pain, he was no longer our patriarch, he was like he was in Fat City. Norberto yelled, “Cut,” and it clearly had taken everything out of him and Norberto of course being a classic director wants six more takes and I was like, “One more, Norberto,” but when you yell, “Action,” everything else goes away and he’s the most present actor you’ve ever worked with. He’s just a delight. Also when he came in to audition Holt later told me, he whispered to Holt, “Which is the guy I have to play to?” He’s still worried about getting a job, which is almost obscene at this point, but he’s a lifer. I think he really set a tone for all the other actors. Every actor said, wow, you can learn so much from him, or this guy’s had the life. Also, just about every actor or actress who came to our set he had done a play with, a movie with, a TV show with, or had slept with. He was just a very social guy. Is that about right, Holt? Holt McCallany: It is. Just to add something to what Warren just said, he talked about him being one of the most present actors that you’ll ever meet. He’s also—and this is something that I really admire about Stacy—he’s also one of the most economical. He does exactly what you need to do and it’s very clear and it’s very precise and there isn’t a lot of unnecessary extraneous stuff going on. He’s right there with you. He looks you right in the eyes and he connects with you and all of that wealth of experience that he has from his life and all of the intelligence that he has, the character is invested with all of that. So you just look at him and you’re right there in the moment with him. 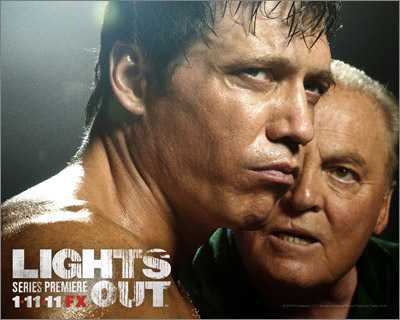 Holt McCallany: I had always wanted to play a boxer all of my life. I grew up watching great boxing films, obviously like the ones you would think, Raging Bull and Rocky and Body and Soul and Fat City, and more obscure movies, like I love a movie called The Set-Up by Robert Wise. Even more recent things Cinderella Man, which frankly before it ever got made was a script that existed around Hollywood for a number of years. It got sent to me at one point and I was like, “Oh, my God, this is a really good movie,” but it’s hard if you’re not a big movie star to get the lead in a really great project. I take my hat off to my friend, Mark Wahlberg, because I know that it took him a long time to make The Fighter and he overcame a lot of obstacles to do it, and now the film is an unqualified success. I’m really happy for Mark. But you wonder, “Will I ever have my opportunity to realize a dream like that?” That’s what Lights Out was like for me. From the first time I read it, I understood very clearly that this was not just a part on a TV show, that this was an opportunity to do something very special. This was one of those tour de force parts that very, very rarely comes along and that it was also in a milieu that I love, in a world that I love, and in a world that I had spent time in. I had done a couple of boxing films and I had been interested in the sport all my life, and I boxed recreationally from the time I was a boy, so for a lot of reasons, my passion for it and my background, I felt like I was the right guy for this part. But my feeling that way and the studio and the network feeling that way are not always going to be the same thing. I was really lucky on this occasion, really, really lucky, that I happened to become the choice for the men who make those decisions. They took a chance with me and showed a lot of confidence in me and gave me the best opportunity that I’ve ever had. I literally thank my lucky stars the day that I was chosen for this part. Lights Out debuted this past Tuesday to 2.4 viewers (including encores, per Nielsen) and can be seen at 10pm exclusively on the FX Network on Tuesdays.